A lifelong dream has become a reality for Collingwood supporter Maddie Shevlin after being drafted to the club late last year. “It was a special moment for me to get that text message from Nick Maxwell, someone who I’ve idolised as Collingwood’s 2010 Premiership captain,” Shelvin told collingwoodfc.com.au. Having been delisted by Melbourne as a rookie early last season, Shevlin remained determined to make it onto the field at the highest level possible. “Obviously I was pretty shattered after being delisted but I knew I had to get over it quickly and shift my focus towards believing that I am good enough and that I have the right attributes to be an AFLW player. Shevlin enjoyed an outstanding VFLW season with Casey where she impressed with a great work-rate and a strong penetrating kick, and these attributes contributed to her winning the team’s best and fairest. 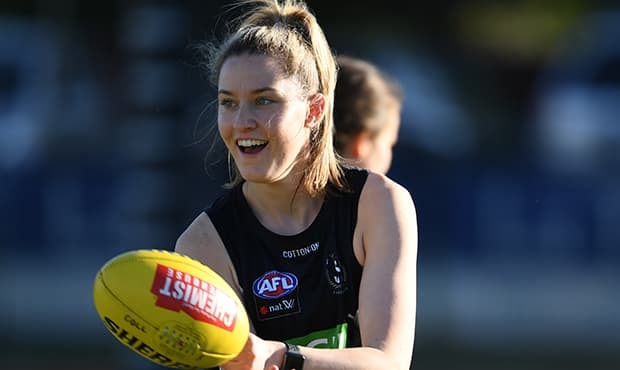 After being selected by Collingwood with pick 19 in the AFLW Draft, the 21-year-old now is embracing her second chance at elite football. “Being here at Collingwood is my real opportunity, where before it’s just been a taste. She admits she is still relatively new to the football scene and is unsure of where she’ll play having crossed-over to the sport from OzTag only three years ago. But Shelvin says she is privileged to now be playing alongside such high profiled athletes at Collingwood and is determined to channel their efforts into her own routine. “The moment you walk in here and there’s Sharni Layton, Ash Brazill and Cecilia McIntosh, athletes who have represented Australia at the highest level, that’s pretty inspiring. Also joining Shevlin in the black and white are her Casey teammates Jordyn Allen and Georgia Gourlay who were also recently drafted to the club. “It’s pretty special to share this journey alongside Jordy and Georgia. “All the draftees are special characters and I think we are building a really good culture which is super exciting to be a part of,” she smiled. Away from the footy field, Shevlin works at Xavier College as a teacher’s aid, which she finds extremely rewarding and she admits she’s implemented many of the life skills she’s learned in her role into her football. Shevlin continues to work towards her main goal of making her AFLW debut this season. “Sitting on the sidelines for the 2018 season was pretty tough so I know what it takes and hopefully an opportunity will come out of this.